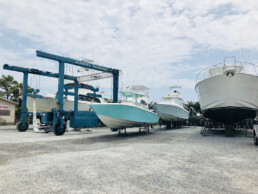 Saunders Marine Center, located inside Orange Beach Marina, operates a full-service boatyard and an outboard sales and service center. Able to accommodate boats up to 60 feet, this facility contains an onsite 60-ton Travelift and a 10,000 square foot enclosed works building. Our experienced project management team is prepared to provide your vessel with a full range of boatyard, crafts, electronics, systems and mechanical services. Saunders Marine Center offers competitive rates and flexible yard space so customers can choose the right option to complete work projects.